5 Best All In One Messenger App Compared – Which One To Use? I use different messaging apps to keep in touch with the different group of people, like – Slack for work, WhatsApp for friends and family and Facebook messenger to keep in touch with my batchmates etc. Now, the problem with this approach is, I’ve to keep multiple apps running at the same time. Making things worse, platforms like Facebook Messenger don’t even have official apps for Mac. This is where all in one messenger apps come in. 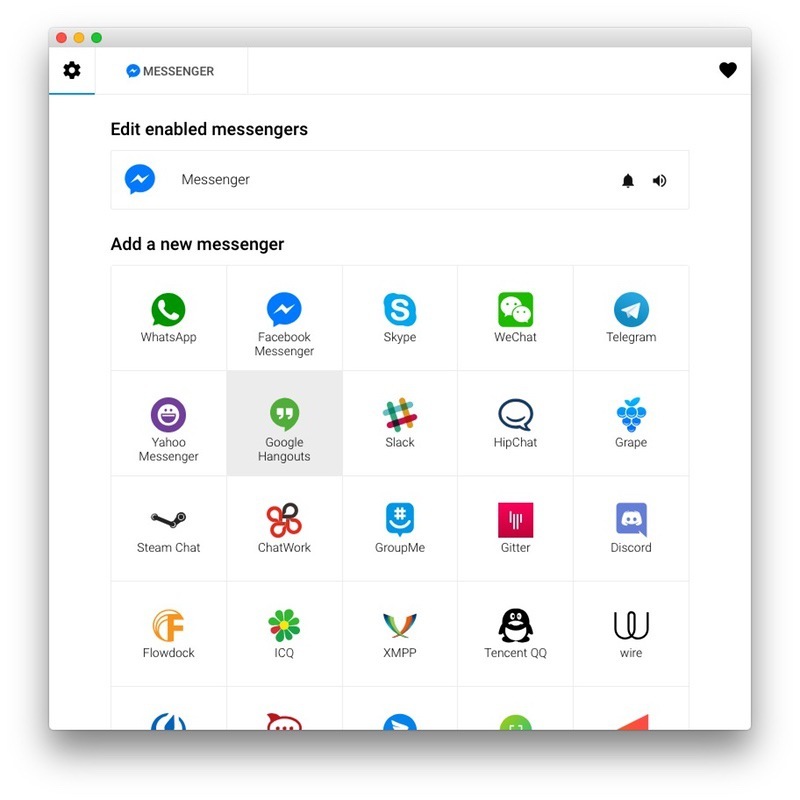 These apps let you manage multiple messaging services/platforms from a single window. When you launch this app, you also launch multiple apps like Messenger, WhatsApp, Telegram or Slack. As there isn’t a perfect all in one messenger for Mac, you have to find the best one for your need. 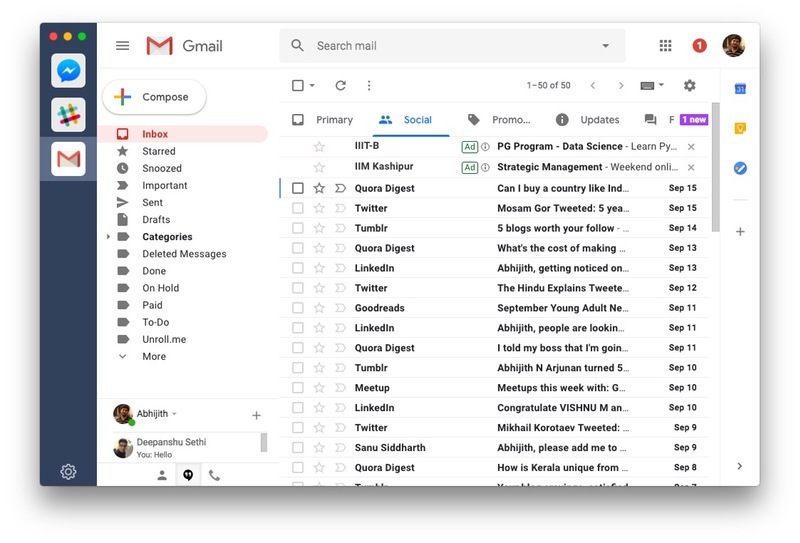 In this article, we’ve listed down the best all in one messenger for Mac. Note: We’ve included a variety of apps here. You will surely find some dedicated all-in-one messengers. But, you will also find some productivity-booster stuff. Shall we begin? All-in-One Messenger is the best choice if you need a casual all in one messenger. 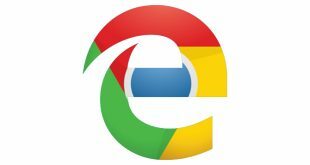 It is a Chrome app, meaning that you must have Google Chrome installed to use this. 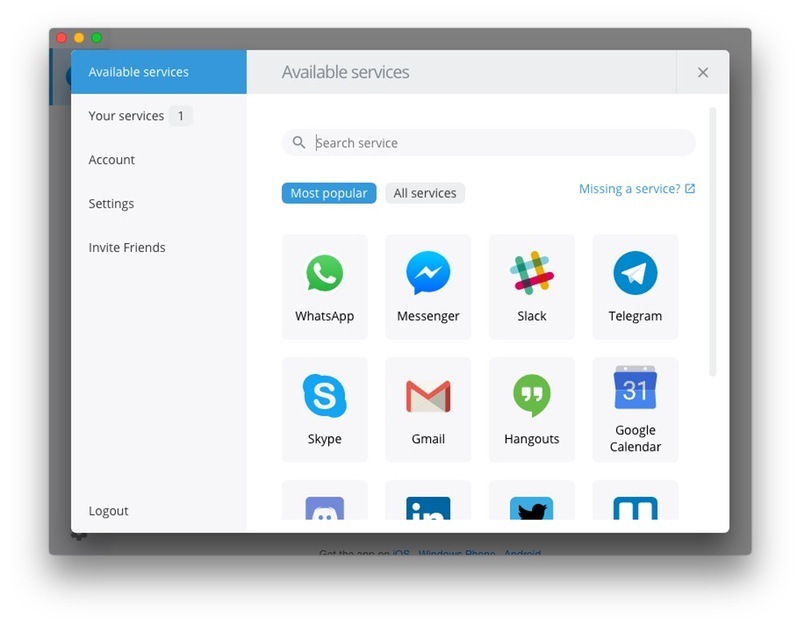 Once you install, however, you can use All-in-One Messenger for managing different services like Messenger, WhatsApp, Telegram, WeChat, Skype (no Skype for Business), Hangouts, Slack, Steam etc. This tool does not support the highest number of Instant Messaging services, though. If you are looking for something less popular, All-in-One Messenger may not have it. Still, common users can count on the tool for sure. Using All-in-One Messenger is also quite intuitive. You can visit the Settings section and add services as you wish. You can also decide Notification and Sound Preferences for each service, which is a handy feature. Despite all these, All-in-One Messenger has many disadvantages of being a Chrome app. I mean, if you are someone who uses Firefox, it’s not your option. For instance, if you simply close its window, All-in-One Messenger will not be running in the background. 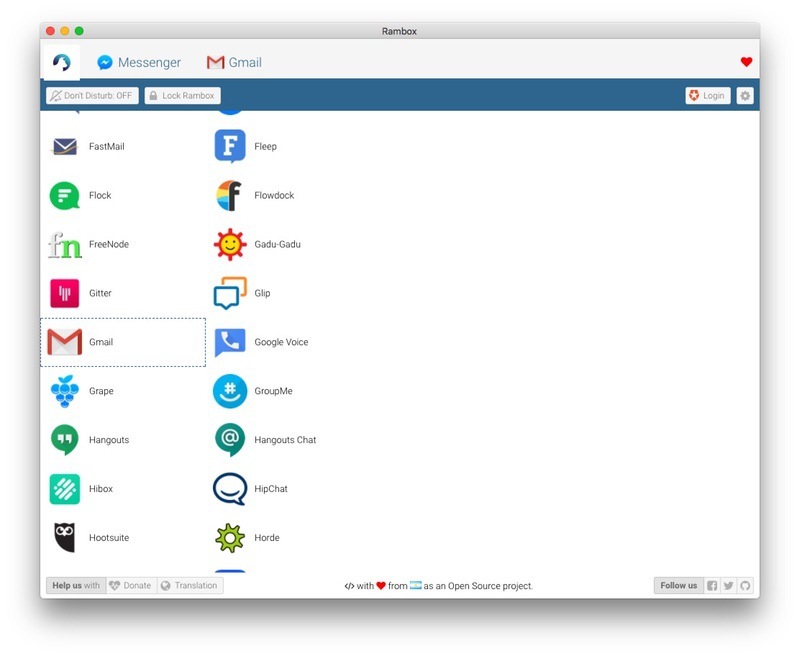 Rambox is the best all in one Mac messenger for professionals. It’s great that you have more control on what you access and how you see things. Rambox is an all in one messenger that can boost your productivity like never before! It does so by allowing you to organize your workspace well. Of course, this tool is made for professionals, who have to manage 150+ messaging services like Messenger, Skype, Slack etc. 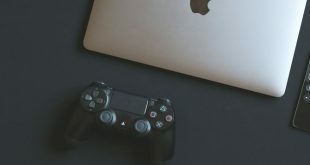 The best part is that you can also manage the professional ones like Gmail, Mattermost, Intercom, Pushbullet, Teams etc, though this will require you to get a premium account. When it comes to workspace management, however, Rambox rocks. You can add as many services as you want; all of them would be accessible from the upper-bar. Compared to the previous choice, you have more control as well. For instance, when adding services, you can decide aspects like appearance and notification preferences. Being a professional-oriented tool, Rambox offers some cool features too. For instance, you can enable the Do Not Disturb mode to disable stop notifications. There is also an option to lock Rambox so that you don’t spend time without these messengers. That having said, additional features are available only in Premium plan, which starts at $4 per month. Available – Windows, macOS, Linux. IM+ is one of the better choices for all in one messaging in Mac. You get a clean UI, a relatively better workflow as well. But, whether you want to pay $18 for all these is your choice. Let’s find out. We find this as the sweet spot between Rambox and All-in-One Messenger. That is, you are not limited to a bunch of services but you have a better set of customization options. But what really separates IM+ from the rest is that it is available for iOS and Android as well. So, you can have a seamless experience macOS, Windows 8, iOS and Android smartphone. IM+ is free to use on Android and iOS, however, if you want fully functional macOS and Windows version, you need to shell out $18 and $4.99 respectively. UI of IM+ has been kept as minimal as possible. You can access all the services by hitting the icons from the sidebar. Going to the Preferences, you can choose options regarding notifications, sound etc. Notifications work better since IM+ is a native Mac app, not something based on Chrome. That having said, we’d to turn on Desktop Notifications to get Messenger notifications. IM+ also brings you all the benefits of being a native macOS app. For instance, even when you close the app window, IM+ will be running in the background. Talking about the features, there aren’t many. But the team is reportedly working towards bringing support for Skype and Slack calls. The problem here is that IM+ has a price tag of $17.99. Manageyum is for people who need more than a few messaging services. While it can smoothly run any web messenger service, it can do more too. Manageyum is the next app that isn’t specifically an all in one messenger. But, considering that a number of messaging services have a web-based interface, Manageyum does the job. It’s a special browser that is made for running web apps like Messenger, Asana, Slack, WhatsApp, TweetDeck etc. In case you did not notice it yet, there is support for some not-so-common services as well. Okay, this is the thing about Manageyum. 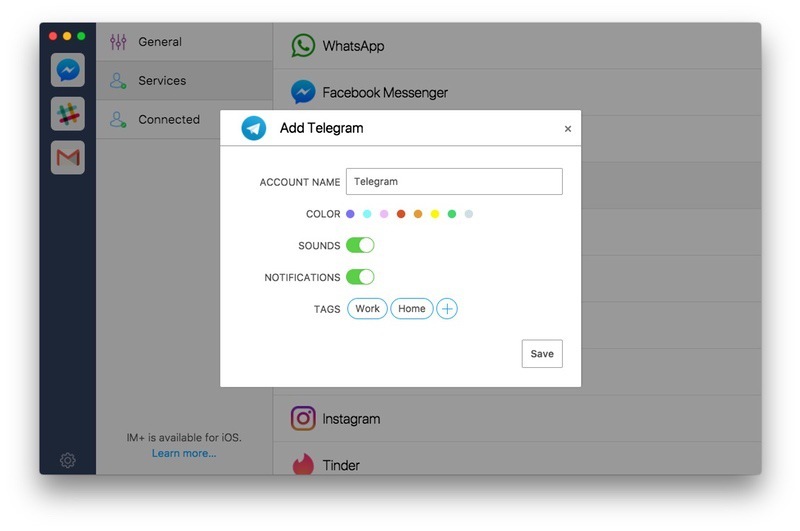 You can run almost all the popular messaging platforms, including Messenger, WhatsApp, Telegram, Skype and Slack. But, you can also some useful apps like Google Calendar or Wunderlist. The best part is, Manageyum lets you add a custom app as well. That is, if a particular app is not officially supported, you can still run it. Another cool feature we found in Manageyum is the Dashboard. You can see an overview of what has been happening in your messenger services. That is quite handy when you’re a busy person. 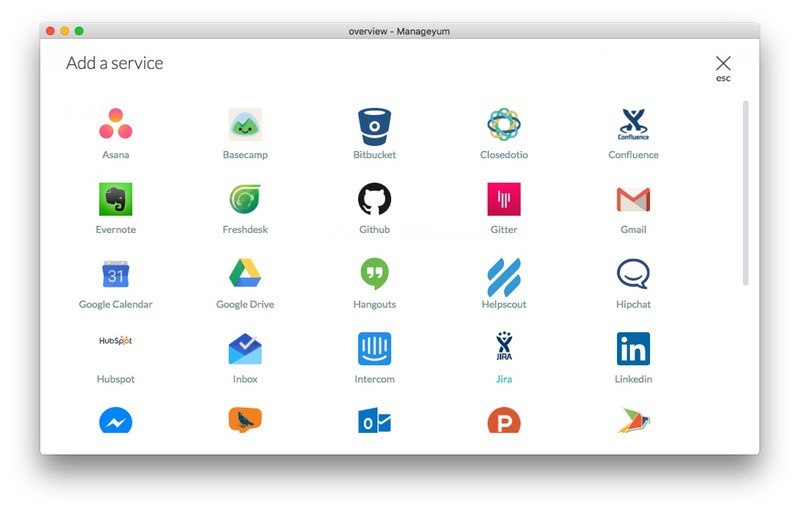 Nevertheless, unlike Rambox, Manageyum is completely free to use. You can simply download the tool and start connecting your services. We’ve saved the best for the last. Franz is the best all in one messenger for everyone out there. You don’t have to worry about glitches or high settings to use this app. It just works. This free messenger app lets you manage a variety of platforms like Messenger, WhatsApp, Slack as well as some other services. The point is, even if you are a professional, Franz would be a sufficient choice for sure. Franz also has one of the best UIs we’ve ever seen. Of course, it’s somewhat similar to others. But, you have quick access to every area. For instance, you can easily disable all the notifications and sounds by clicking on a single button. There are also some cool features in the app like GPU Acceleration and support for various languages. Like other dedicated macOS apps, Franz apps quite smoothly. You have the benefit of native notifications as well. Another cool feature we loved is Franz Sync feature. When you log into other devices using the Franz account, all your messenger data will be automatically synced. This is a handy feature when you use a huge number of computers. Which is the best All In One Messenger App? 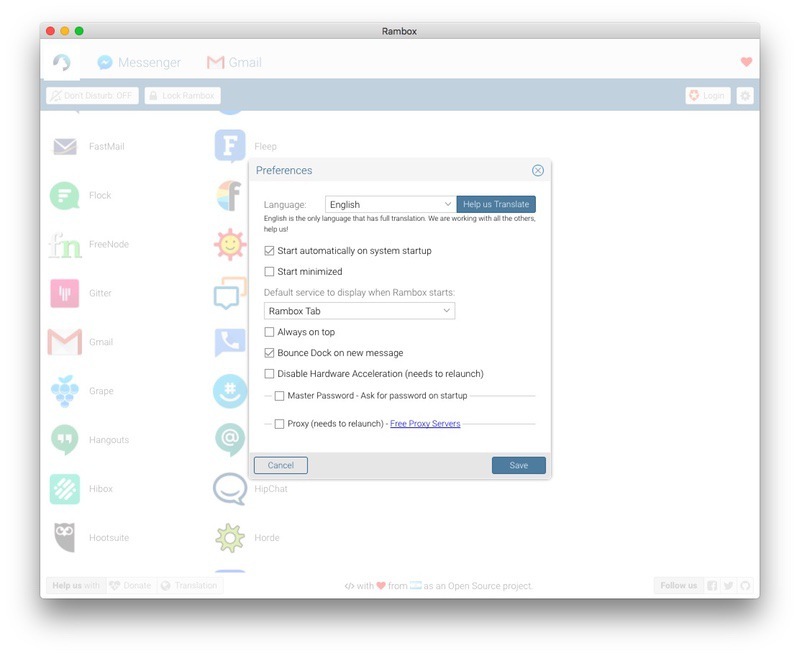 Every day, Franz would be our go-to choice for all in one messaging in Mac. That having said, you have some other options too. For instance, if you are a professional who uses some rare apps, Rambox will make more sense. On the other hand, Manageyum makes it easy to run almost any web app with ease. The point is, you should use an app that you think is the best option out there. We hope this article helps you do that.